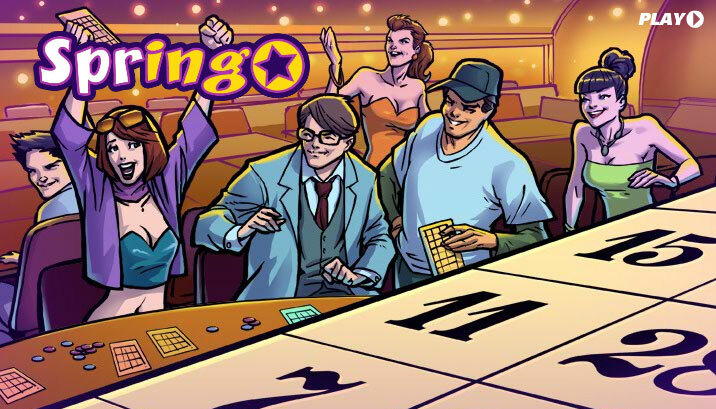 Springo is the World's first spread betting bingo game. Based on a 55 ball draw this game offers you a wealth of markets and betting opportunities that you won't find anywhere else. Choose to play either a 'Quick' game for that quick hit, or an 'In-Play' game for a more in-depth experience with additional betting opportunities. First thing to decide upon is what type of game you want to play. You can either select a 'Quick' game where once you have confirmed your bet, all balls will be drawn until a result is reached or select an 'In-Play' game where once you have confirmed your bet, the draw will be split into 3 mini draws of 20, 20 and 15 balls. You will then have the chance to take your profit, cut your loss or break even between each draw until a result is reached. Note that if you select one of the 'Until an event' markets, you will have the opportunity to take profit, cut losses or break even after every ball that is drawn. Whichever type of game you select the next job is to choose your Bingo card. A card will automatically be selected for you but if you wish to change your numbers, simply click 'Get New Card'. If you're happy with your card it is time to choose your market. There are two main types of market to choose from: 'Markets' and 'Pattern Markets.' You can switch between these types of market using the tabs at the top of the Markets menu. This market is a prediction on the total number of hits on the card. The result of this market will be determined by how many of the 55 numbers drawn are matched with the numbers on your card. For example, if 15 numbers are matched, the result will be 15. This market is a prediction on the value of the first hit multiplied by the value of the last hit. The result of this market will be the value of the first number matched, multiplied by the value of the last number matched in the 55 ball draw. For example, if the first number matched is 10, and the last number matched is 25, the result will be 250. This market is a prediction on the number of balls drawn before a hit. The result of this market will be the number of balls that are drawn before one is matched with a number on your card, including that ball. For example, if the first hit comes from the 9th ball, the result will be 9. This market is a prediction on the number of balls drawn before a hit, multiplied by the value of that hit. Similar to 'Draw to a Hit' the result of this market will be the number of balls that are drawn before one is matched on your card, multiplied by the value of that matched number. For example, if the first hit comes from the 10th ball, and is the number 7, the result will be 70. This market is a prediction on the sum of all unmatched numbers drawn until a hit. The result of this market will be determined by adding up the numbers on the balls drawn that are not matched until the first hit. For example, if the unmatched numbers drawn are 5, 10, 22 and 4 before a number is hit, the result will be 41. This market is a prediction on the sum of all matched numbers drawn until a miss. The opposite to 'Ticking Bomb', the result of this market will be determined by adding up the numbers on the balls that are matched until one of them is unmatched. For example, if the first 3 balls are matched and are numbers 31, 2 and 18, and the next number drawn is unmatched, the result will be 51. This market is a prediction on the sum of all numbers drawn until a corner square is hit. The result of this market will be determined by adding up all the numbers on the balls drawn before one of the corner squares is hit. For example, if the first five balls drawn are numbers 3, 4, 22, 7 and 30, and the next ball drawn matches one of the corner numbers on your card, the result will be 66. There are eight 'Pattern Markets' to choose from. The result for each pattern market will be determined by the sum of all numbers successfully matched that form part of your chosen pattern. 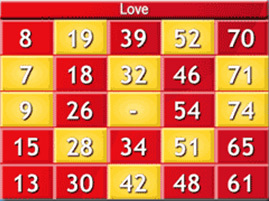 Below you can see an example of how the 'Love' pattern appears on the card. The yellow squares indicate numbers that form part of the pattern and they turn blue when they are hit. Numbers are randomly drawn using the 'Springo' draw mechanism. When each ball is drawn, it is placed in the display rack underneath the draw mechanism. This way you can keep a record of all the numbers that have already been drawn. You can also follow the current status of your bet by looking at the 'So far' tab situated to the bottom right of your card. 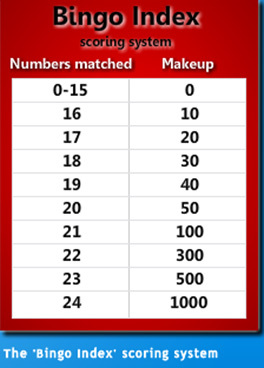 Red signifies that the number does not form part of a pattern and has not yet been matched with a number from the draw. Yellow signifies that the number forms part of a 'pattern' and has not yet been matched with a number from the draw. Blue signifies that the number has been matched with a number from the draw. When the draw has come to an end, a summary of your bet will be displayed in the bet panel including details of the result and your profit or loss. For an in-play game, if you have taken a profit, cut a loss or broken even before the draw has finished a summary of your closing bet will also be shown.